Fatah and Hamas could be on the verge of reaching a power-sharing agreement, which could further relax the blockade on the crossing point with Egypt. Revealing details of the possible agreement in a telephone interview with Associated Press, Mohammed Dahlan, a former Fatah politician in exile, hinted that the moment has arrived for political authorities to cooperate to end the dire situation of the Palestinians. “We both realized it’s time to find a way out” for Gaza, said Dahlan as he made reference to Gaza’s newly elected Hamas chief, Yahya Sinwar. The agreement could be followed by the building of a $100m power plant for Palestine on Egyptian territory to be funded by the United Arab Emirates (UAE). Dahlan also rejected claims that he is intending to take-over the mantle of leadership by engaging in brokering such a political agreement. Although he admitted that he had aspired to be president when he “was younger”, he stated that he no longer harbors such ambitions. “I can see the situation” now, he said, adding that “seventy percent of the land is in the hands of the Israelis, and they have no intentions to give us a state.” He claimed that he is motivated by patriotism and would do everything in his power to prevent a further drifting apart of the Palestinian territories. Azzam al-Ahmed claimed that the Palestinian Authority supports Gaza with $1.2 billion per annum to cover its expenses. There are also reports that Sinwar did not consult with members of Hamas on the discussions he had with Dahlan. The group’s leaders usually hold extensive consultations before adopting important decisions. 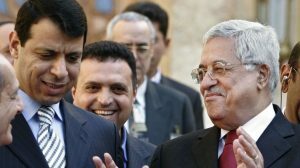 As the situation in Palestine continues to be dire especially in the Hamas-controlled Gaza, Dahlan said “it’s better for Gaza that I stay in the diaspora and approach everyone who can extend a helping hand to Gaza.” Nevertheless, Fatah continues to be critical of Dahlan’s dealing especially with Egypt.